All orders received prior to 10:30 AM PST are processed the same day we receive them. If your order is received after that timeframe we will process your order either that same day or the next business day. If you only order a Bond (with or without E&O Insurance) or notary supplies (not including seals, stamps or embossers or any other custom items) and the order is received by 10:30 AM PST it will be shipped out the same day. If you order a notary seal/stamp, embosser or a custom item we will make it on-site usually within 1-3 business days. However, we cannot ship a notary seal/stamp or embosser until we receive your original Certificate of Authorization to Manufacture Notary Public Seals. The time it takes for us to ship out your order will depend on how fast you can get your original Certificate of Authorization to Manufacture Notary Public Seals to us. Most orders are shipped within 24-72 hours if your original COA is sent to us the same day you place your order. Can you send the bond today? Yes we can! We must receive your order no later than 10:30 AM M-F (excluding holidays) in order for us to be able to ship the bond out same day. If you are ordering a notary package or other custom items (seal, stamp, embosser, etc), there is an additional fee to send just the bond separately. The fee is $15.00 to send the bond via 2-Day shipping, or $25.00 to ship it Overnight. Your order must be marked clearly for the expedited shipping. The best (and quickest) way to place your order is through our website. You can also scan your order form and email it to customerservice@valley-sierra.com or fax our Fax Order Form to us at (800) 420-8351 with a copy of the "Certificate to Manufacture Notary Public Seals". (This ensures accuracy). 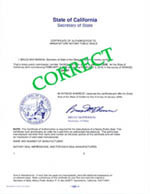 Please be sure to mail the original "Certificate of authorization to manufacture notary public seals" as soon as possible if your order includes a Notary seal/stamp or embosser. Sorry, we do not take over-the-phone orders for accuracy reasons. Which certificate do I mail to you? You will need to send us the certificate with the blue State Seal and the numbers 1. and 2. at the bottom. See the picture below. Will I get my original "Certificate to Manufacture Notary Public Seals" back? No. It will be forwarded directly to the Secretary of State's office per State Law. Can I fold my "Certificate to Manufacture Notary Public Seals" when I send it to you? Yes. Use the Business Reply Envelope enclosed with our flyer. If you did not receive an envelope, please mail to P. O. Box 610, Orangevale, CA 95662. If you use any method of delivery requiring a signature acknowledging receipt from us, please send to our street address: 4401 Hazel Ave, Ste 110. Fair Oaks, CA, 95628. Return receipt mail sent to our post office box can actually delay our receipt of your Certificate of Authorization. Do I add tax or shipping to your prices? Yes, we do require tax and shipping & handling on all orders. 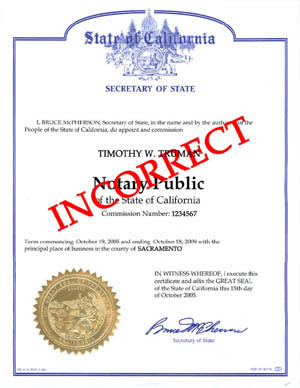 California sales tax of 7.75% is required on all orders, except on Notary Bonds and E&O Insurance. The online store will total the correct sales tax for you. If you use our fax or mail order form please calculate the correct tax on all taxable items. If you have questions on the tax amounts you can email us at customerservice@valley-sierra.com. Shipping options and prices shown on our website during the check out process. Shipping prices are also listed on our fax and mail order forms. If you do not select a shipping & handling option we will automatically choose the cheapest option and add it to your order form for you. How long before I receive my order once it has shipped? Depending on your order, we ship by a courier of our choice (usually UPS) Shipping normally takes 3-7 business days for Ground Service, 2 business days for the 2-Day Service or 1 business day for Overnight service. We do not ship on Holidays or weekends. Shipping & handling is required on all orders. If desired, we can also charge your FedEx or UPS account upon request. However, a $3.00 non-refundable handling fee applies should you choose to use your own shipping account. Where do I enter my FedEx account number and tell you that I need my bond overnighted ahead of the rest of my order? Navigate to our online store and place your order. Following the billing and shipping address areas, there is a place for you to indicate any special delivery instructions or comments. Please enter the name of the courier (FedEx, UPS, etc. ), your account number, what item(s) you want expedited, and how quickly (Priority Overnight, Overnight, 2nd day). **Please note no ground service for FedEx is available. Also, a $3.00 non-refundable handling fee applies. How long does it take to manufacture my seal or embosser? Our normal production time for these items is 24 to 72 hours Monday through Friday. We currently do not process orders on holidays or weekends but we do everything we can to have your order ready as soon as possible. Please note that no seal or embosser can be shipped until we have received your Original Certificate of Authorization. You are responsible for delivering this document to us - please do so promptly and via guaranteed delivery if time is of concern. I have to file my bond tomorrow (or the day after tomorrow). What should I do? 10:30 AM PST M-F (excluding holidays), your bond will be sent as requested. However, we are NOT responsible for lost or misdirected mail or courier (UPS or FedEx) shipping or delivery of your bond. Please do not risk missing your filing date due to misdirected mail or courier (UPS or FedEx) shipping. Do you allow any substitutions in your packages? Yes we do, but not for all items and not for all packages. There are many customizations offered through our website only. All allowed substitutions are shown as options for each package or product on our website. These are web specials only and are not offered on mail or fax orders. Please consider placing your order through our website to take advantage of our substitutions and web specials! You will receive a confirmation email from us within 2 hours of order placement. If you have any questions after you place your order, please send an e-mail to customerservice@valley-sierra.com. Are your bonds and E & O policies good for 4 years? Yes, all of our Notary Bonds and Notary E & O policies sold in the Basic, Bond/E&O, Essential, Premier and Professional packages are valid for the full term of your notary commission (four years). The premiums shown are the full four year premiums. Do your E & O policies have a deductible? No, no deductible applies to our individual notary E & O policies. Do you sell group E & O coverage for notaries? Yes we do. Please call or send an email to customerservice@valley-sierra.com. Include your name, amount of coverage needed, number of notaries to be covered, and the best time to return your call. What if I don't buy enough E & O coverage to meet my signing agency's requirement? If you are required to increase your E & O coverage mid term by a third party, we can help you. Please call or email us for details. I just made a claim on my E & O coverage. Can I increase my limit? No, any mid-term coverage increases are subject to having no claims or losses. It's always best to purchase the highest limit you think you will need during your commission at the start of your commission. Policy limits are lowered for each claim paid during the term. Don't take a chance and increase your coverage today! Affordable options are shown with all packages sold containing this item. Why can't I purchase E & O only online? All E & O pricing online is only valid when purchased at the time your bond is purchased. We do offer E&O even if you do not have a bond through us. Please call or email for further information. What happens if I think I need to make a claim? Please call our office IMMEDIATELY and have the following information available: Your name as it appeared on your commission, the commission number and dates, your journal, any paperwork related to the claim (including papers served, if applicable). Please take a moment to compose a summary of the transaction to the best of your knowledge and be ready to fax or email all requested information to us following your telephone report. Can I get a refund if I miss my filing date? All items except custom made items (seals, stamps, and embossers) are fully refundable in the case of a missed filing date. Simply return all original items to us at your expense and we will issue a refund upon their receipt. (Bonds and E & O policies returned MUST be the originals in order to be refunded - no exceptions.) However, if you plan to refile for a new commission, simply retain the items ordered and give us a call or send an e-mail to customerservice@valley-sierra.com when you receive your new commission information. A $10.00 re-issue fee will apply to your bond (no charge for E & O), and any replacement seals, stamps, or embossers are at the current pricing. Do you charge a fee if I legally change my name during the term of my commission? No. Name change riders are free, subject to the receipt of your online order for a notary name change. Please note we do require shipping & handling on all orders including name change orders. We also require that you fax or email us a copy of your Original Gold Commission Certificate (with previous name) & Amended Gold Commission Certificate (with new name) before we can process your order. We are only able to change names on bonds and or E&O policies that we have issued. If you did not purchase your original bond and or E&O policy through us for the commission you need amended we will not be able to process your request. Can I buy notary supplies in bulk or for resale? Please email customerservice@valley-sierra.com with your request. Do you sell notary bonds and notary E & O policies for other states? We currently only sell notary bonds and notary E & O for California notaries. How do I replace the Deluxe Stamp ink cartridges? Our office is closed for all standard holidays.